You're the Conductor of Your Family's Symphony! Joy will time her return from Scotland to be home as Thomas and Sarah fly in from Oxford while Joel and Nathan will already be home to greet them. I can't wait. I am already planning meals, fun times, movies, times in a cafe and late nights to sit on their beds speaking of dreams and soul issues. But, as always, it starts with a family ritual that happens every time one of us returns home. It is a home ritual that says, "We are so glad you are here. This is where you belong to a people and a life." Nathan’s text set off a familiar flurry of activity as I hurried through the house, eager to complete every preparation before the car headlights bounced off the front windows. Dinner on the stove, cookies in the oven. Joy, our youngest, was coming home from a semester abroad, her first stint to be overseas by herself for four months. Joel and Nate had been dispatched to travel the familiar hour of highway to the Denver airport and had sent the text as soon as they exited on County Line Road, two miles from our home. I had just enough time to light the lantern at the front door and write “Welcome Home, Joy!” on the small slate board in chalk colors of red and blue. Each piece of furniture, each architectural detail, each tradition and ritual sings to us of beauty, safety, and growth—and of the vision, planning, thought, and artistry that went into fleshing out the vision of home that captivated me from the very beginning. Even as an orchestra needs a conductor to choose the music, lead rehearsals, and unite all of the instruments into a harmonious sound, so every home needs someone who conducts what I call the life music of a home—its atmosphere. The one who conducts is responsible for bringing out the swelling themes, the steady bass notes, the drama of percussion kept in its place, the soaring melodies and intricate counterparts—all the instruments sounding together in a symphony of grace. In our home, for the most point, the conductor of life within its walls is me. This is the role I have chosen, the role that suits me best, though my husband, Clay, adds his own unique rhythms and melodies and the whole family helps perform the ultimate creation of our shared life. And even as an orchestra must practice the music—with mistakes and interruptions scattered along the way—so our home building has been a process that will take a lifetime to perfect. From the beginning, the vision Clay and I had for our home was to reflect the reality of the living God—to embody His sparkle, pleasure, artistry, fun, and intimacy. God’s truth was to be taught, cherished, obeyed daily within the boundaries of our home. His love was to be the oxygen that each one of us breathed. Observing the words and life of Christ, I began to understand that a servant’s heart would be required to adequately meet the needs of those who stepped through our doors—whether those needs involved friendship, a place to rest, forgiveness and grace, guidance and instruction, a safe haven from the stresses of the world, or just a place to retreat from the mundane or the burdens of life. 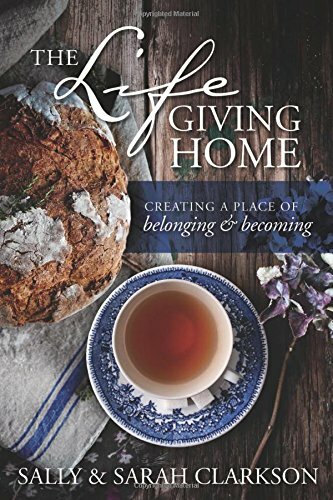 And this task began with a heart commitment to make home a holding place for all that is sacred, beautiful, valuable, and reflective of His reality. Do you see yourself as the conductor of your family's symphony--your own magnum opus? How would envision yourself in that role change your life? Read more about composing your family symphony in The Lifegiving Home!